Best Pizza in Arkansas: Our 10 Favorites! Some say that pizza is as American as apple pie. Whether that’s true or not, there are definitely more than a few great spots in Arkansas to grab a slice of some delicious pizza pie. From classic Southern pies to wood-fired, artisan delights, these 10 pizza restaurants in the Natural State will have your mouth watering. You’ll find the best Chicago-style pizza at Gusano’s! This great pizza place opened in Little Rock back in 2004 with an idea by president and founder Ben Biesenthal. Gusano’s now has several locations in Arkansas, Missouri, Kansas, and Texas. Located in the Mill District of South Fayetteville, this great pizza place has been serving up wood-fired artisan pizza since the summer of 2014. When available, Wood Stone uses local ingredients to make their mouth-watering pies like the Tatonka, the Bloomington, and the Thai Curry. “Be our guest!” at MJ Pizzeria where their vision is to always provide an amazing dining experience! This great pizza place just opened its doors in 2015 and has already made a name for itself in Springdale. 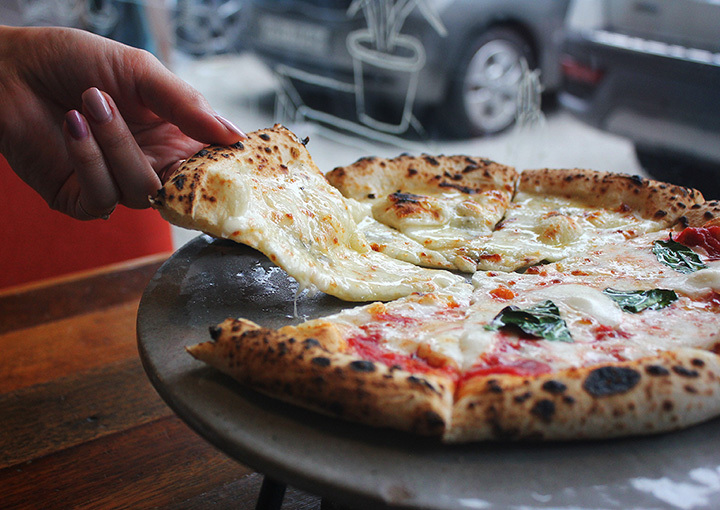 MJ’s serves delicious wood-fired pizza pies, homemade pasta, and craft beer. An international pizza contest winner for multiple years, many consider Nima’s to be the best pizza they’ve ever eaten! You’ll find them in the heart of the Ozarks where they’ve been in business for over 17 years now. Adding to what makes Nima’s the best of its kind, they donate all gratuities to their local Salvation Army. This award-winning pizza and pasta place has been a Hot Springs landmark since the July 4, 1975. At Rod’s Pizza Cellar they make the pizza dough every day because who wants to eat frozen pizza that may contain strange ingredients? Just ask the locals, er the Villagers, in Hot Springs and they’ll tell you why Rod’s tastes so good! This fun, friendly, family-owned pizza restaurant serves the best brick-oven baked pizza in the region! Multiple generations have been keeping a family tradition that began in back in the 1950s. Steffey’s Pizza has been rollin’ out the dough and serving the Lavaca area since 1981. This great pizza place has been keeping it mellow since that famous hippy culture of the 1970s. The mission at Mellow Mushroom is to provide delicious food in a fun and creative environment. Mellow Mushroom, the originator of classic southern pizza, has kept on with their founding dream of making the most delicious, craveable slice of pizza on the planet. What else do you need besides a great pub and a hot slice of pie? You can get both here at Papa’s Pub & Pizzeria, voted Fort Smith’s best pizza and tavern. At Papa’s you’ll find great music, laughter, and conversation in addition to the mouth-watering pizza.